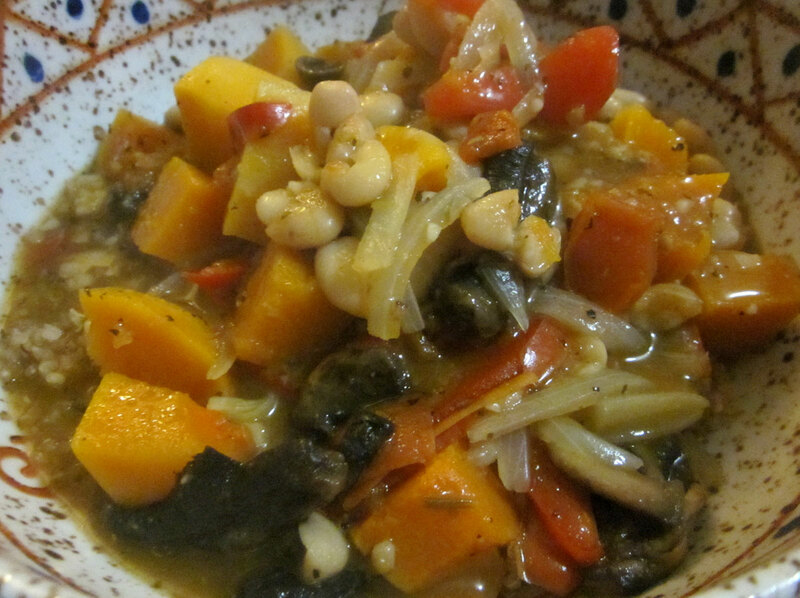 OK, so I haven’t blogged about this stew before, but pumpkin and white beans have certainly been featured. Perhaps I need to branch out a bit more. Or maybe I’m going through a phase. Or I could be addicted to pumpkin. Whatever it is, it could be worse! I started out thinking about making some pumpkin soup, but it really isn’t soup weather here, at least not by my standards. I’m not sure why, but I only really want soup when it’s cold. It doesn’t make sense since I happily eat other hot meals, but there you go. Maybe it’s because there’s something so comforting about soup, and when it’s warm and sunny, such comfort isn’t required. So I ended up making a stew instead. I never said it made sense. I made it around lunch time, after we got back from the markets so I could have the doors open to help with the onion effect. The onions we get from the markets are really fresh and strong. I can’t be in the same room when one gets chopped up if the doors are closed. Well, I can be if I want to have really red, sore, watery eyes for a couple of hours. Heat some olive oil in a pot and add the onions and garlic. Cook for a few minutes on a medium heat until the onion is softening then add the tomatoes and cook for a few more minutes. Add the stock, basil, rosemary and paprika, then put on the lid and simmer for 10-15 minutes. Then add the pumpkin, put the lid back on and simmer on a low heat for about another 10 minutes, or until the pumpkin is nearly cooked. Then add the white beans and pepper and finish cooking. Meanwhile in a fry pan, heat some oil to cook the capsicum and mushroom. Put the capsicum in first and cook for a few minutes over a low to medium heat. Then add the mushrooms, and a little salt and pepper and continue cooking over a low heat. Add to the pumpkin and bean mixture just before serving. I think fresh herbs would work really well in this too, but I didn’t have any of the ones I wanted to add. I did have parsley, which I meant to add at the end, but I forgot – oooops! 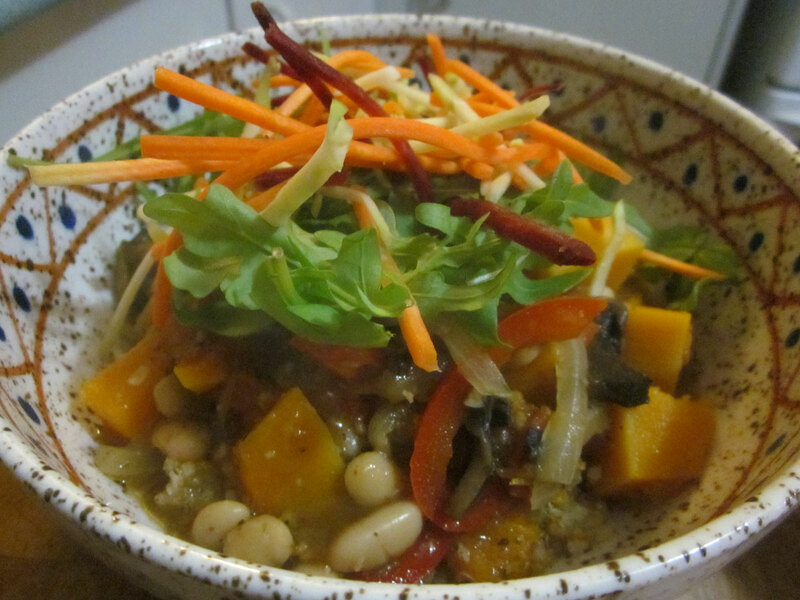 We had it served over quinoa and topped with some rocket and salad, but I think it would work with rice, pasta or any grain really. Or just have it on its own, it’s quite tasty.